Owen's enduring legacy comes in a variety of shapes and forms, from Benjamin Britten's War Requiem to Pat Barker's novel Regeneration, not to mention translations and poems written in homage to Owen. There are also a few - albeit rare - examples of Owen's poetry adapted in comic book formats, and illustrations intended to accompany Owen's poems also belong to that vast body of intermedial works inspired by the war poet's lines. Among those visual responses, Dulce et Decorum Est would appear to represent the most frequently chosen text. Here at the Université Polytechnique Hauts de France of Valenciennes, we began to work with Masters students at the Faculty of Arts last academic year to produce two exhibitions: one in situ at the Forrester House of Ors based on art films made by the students, and another that will be held at the Centre d'Arts Ronzier from 5-13 November 2018, featuring artworks and paintings, in parallel with an international Owen in/and France conference for scholars (5-6 November 2018). There have been other artistic productions around Owen's burial place and the meaning of what lies beneath the ground: we were fortunate to benefit from a collaboration with professional glassmakers to experiment on how we could include remains and artefacts found in the soil of Ors in designed glass pieces. Owen's poetry is made to resonate with each artist's aesthetic mode, technique and comprehension of both the original text and its French translation. The starting point of Resonances was the Forrester house at Ors and the idea to let everyone apprehend the location, ponder what happened and what this meant regarding Owen's death. Valenciennes being geographically close to Ors, we wanted to give the students, who had no prior knowledge of who Owen was and where he had fallen, the opportunity to discover the site before embarking on the project. The sensorial and physical contact with the location at Ors actually turned out to be the main trigger for those young artists' inspiration. Walking along the canal, listening to noises in the forest, collecting anything from leaves, stones to fragments of tree bark, or spending time in the cellar whence Owen wrote the last letter to his mother, reading the poems, all of that stood at the core of this experience. They all came back with Owen's words ringing strongly in their minds and then created a post-Owen body of works that mingled with the memorial meaning, thus giving full meaning to the project's concept of Resonances. Key for the artists of the selected works pictured here was the interrelation of memory, earth, and the dialectic between the visible and invisible traces of Owen's poetry. Special thanks for this art project go to Nicolas Devigne, Marcel Lubac and Maxime Turpin from the Faculty of Arts. They have been of great assistance and guidance to the students and are wonderful colleagues to work with. 1/ Mathilde Blondeel, Le masque forestier (Forest Mask). 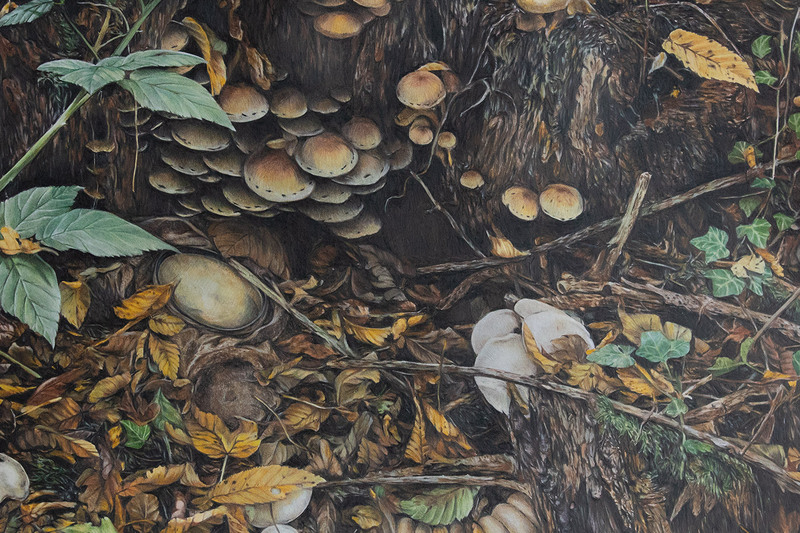 Colour pencils, 2018, 42 x 29.7 cm based on vegetal material collected near the Forrester House. The artist's text written in African language translates Owen's last letter to his mother dated 31 Oct 1918 to show how this poet's death can resonate with contemporary wars in the world, in this case in Africa. The artist explains that she translated Owen's last letter to his mother in Sénofou, one of the sixty-five languages spoken in the Ivory Coast where Ogou was born, and which has suffered from wars for decades. The title means ‘From Death into the Light'. 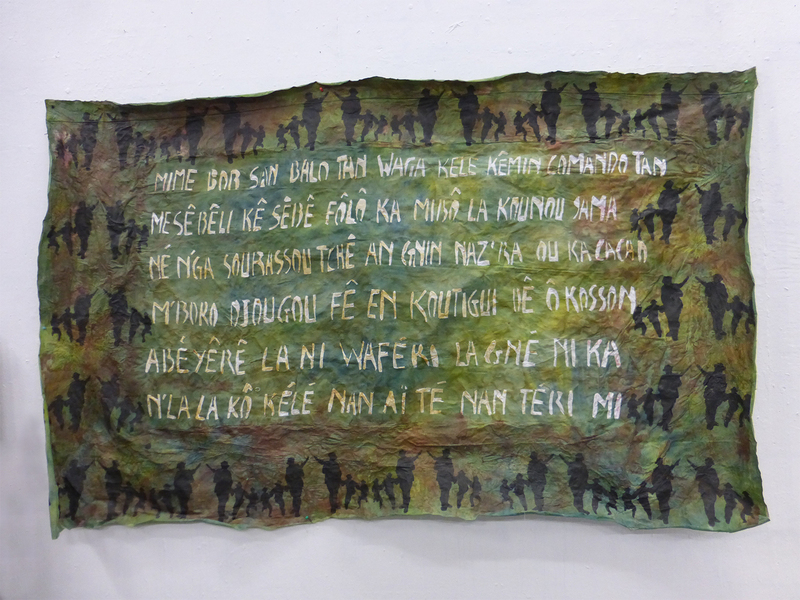 She painted Owen's letter in Sénofou on a very stiff piece of khaki fabric previously dyed according to a traditional African technique. The stiffness is meant to evoke the discomfort of Owen and all the soldiers during cold nights in a humid cellar before battles such as the one along the canal on 4 November 1918. The letter to his mother is of importance as it recalls how much women at home suffer from the war when their sons die. 3/ Félicia Laude, Portraits of Wilfred Owen. 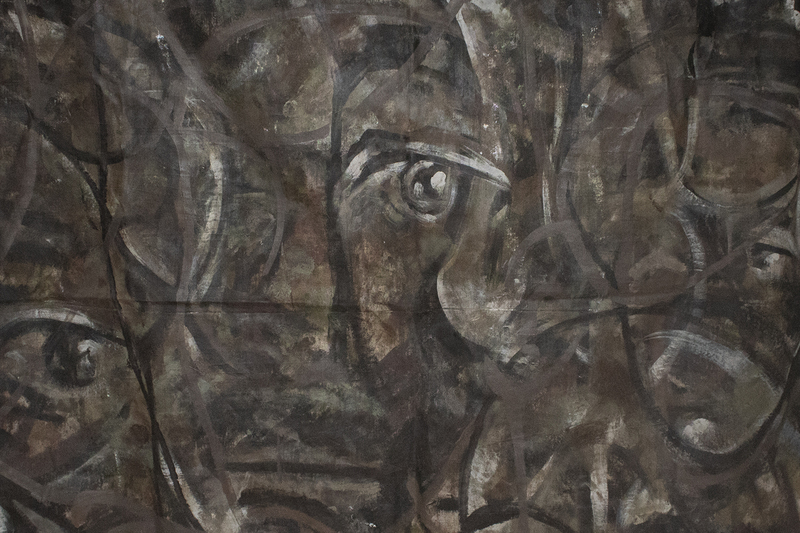 Acrylic paint and ink on dyed linen, 2018, 150 x 230 cm. Cite:Wilfred Owen: Resonances by Brigitte Friant-Kessler at http://writersinspire.org/content/wilfred-owen-resonances-0. Accessed on Monday, April 22, 2019. If reusing this resource please attribute as follows: Wilfred Owen: Resonances at http://writersinspire.org/content/wilfred-owen-resonances-0 by Brigitte Friant-Kessler, licensed as Creative Commons BY-NC-SA (2.0 UK).